Benigni's speeches were from the heart. They made my day. Roberto Benigni was the surprise winner of the Best Actor and Best Foreign Language Oscars in 1999 for his film "Life is Beautiful." 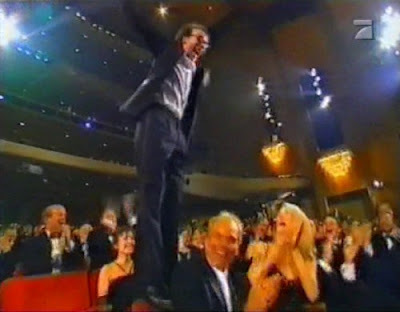 Benigni was only the third person ever to win an Oscar for a non-English speaking role, and his awkward but energetic acceptance speeches were highlights of the show. Benigni's next film as a director and star was a live-action version of "Pinocchio" in 2002. It was a hit in his native Italy, but it bombed domestically, earning less than $4 million. The movie was nominated for six Razzie Awards, with Benigni crowned Worst Actor. Benigni hasn't directed a movie since 2005's "The Tiger and the Snow," but he will be seen this year in Woody Allen's next film "Nero Fiddled." Just joyous! Thank you for posting.